You applied for Social Security Disability and you just got your notice in the mail that you didn’t qualify for benefits; now what? The first step is to file an appeal within 60 days of the date you receive the letter containing the Social Security Office’s decision. What happens after you file your appeal? The first step in the Social Security appeal process is reconsideration, which is a review of your claim by someone who did not take part in the first decision. All the evidence submitted with the original claim is reviewed in addition to any new evidence you might be able to supply. Reconsideration falls into one of two categories — medical and non-medical reasons you were originally denied. After reconsideration, if you still disagree with the decision you have the option to ask for a hearing. The hearing is conducted by an administrative law judge that had no part in the original reason you were denied benefits or the reconsideration decision. You might be asked to supply additional evidence to provide more clarity. The hearing is typically held within 75 miles of your home. At your hearing, you may bring witnesses, such as medical or vocational experts. The administrative judge will question you and any witness you bring. You have the option to have a representative at your hearing. Learn more about your right to representation. If you disagree with the hearing decision, the next level of appeals is the Social Security Appeals Council. The Appeals Council will review your request but may deny the appeal if they believe the hearing decision is correct. The Appeals Council will send you a letter explaining the denial. If you disagree with the Appeals Council’s decision, you may file a lawsuit in a federal district court. Instruction on how to do this will be included with your letter from the Social Security Appeals Council. 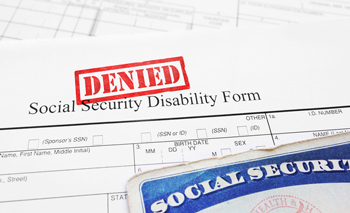 If you think you’ve been wrongfully denied Social Security disability benefits, a Social Security lawyer will be able to help you build your case and determine next steps. Contact a KBG attorney to get the Results You Deserve®.